Donald Trump has said he will be making a visit to the Republic of Ireland at some point this year. During a press conference with the taoiseach (Irish PM), the US president confirmed he would make the trip as Ireland is "a special place". He was meeting Leo Varadkar in the White House as part of St Patrick's Day celebrations in Washington DC. Mr Trump said that he and Mr Varadkar have become "fast friends". 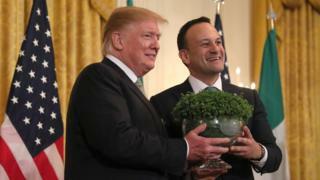 Later on Thursday, Mr Varadkar presented the US president with the traditional bowl of shamrock in a ceremony that dates back to the 1950s. Speaking during the ceremony, the taoiseach said he could see the results of Mr Trump's ambitions to "make America great again". He added that the US should not lose sight of the things that made it great already, such as immigration, freedoms and civil rights. "I believe the greatness of America is about more than economic prowess and military might," he said. He thanked Mr Trump and Congress for a new visa programme which will allow a limited number of Irish citizens to work in the United States each year. Democratic Unionist Party (DUP) leader Arlene Foster has already said she hopes to invite Mr Trump to attend the Open golf championship, which will be staged in Northern Ireland this July. On Thursday she attended a lunch on Capitol Hill hosted by House of Representatives Speaker Nancy Pelosi, and addressed by Donald Trump. During a press conference with Mr Varadkar, Mr Trump also addressed the Brexit deadlock. He said the Irish border issue was "one of the most complex points", but did not offer thoughts on how it should be resolved. Mr Trump added. "I'm surprised at how badly it has all gone from a standpoint of negotiations but I gave the prime minister my ideas of how to negotiate it, she didn't listen to that and that's fine but it could have been negotiated in a different manner." Mr Varadkar told reporters he had a different view to Mr Trump on how Brexit should be handled, and that it would be "a few years" before the UK "sorted itself out". Earlier on Thursday, Mr Varadkar met the US Vice-President Mike Pence, at an event where he said that he is judged not by his sexual orientation but by his political actions. Mr Pence has been criticised in the past for his conservative views on LGBT rights, and last year there was much focus on his meeting with the taoiseach. At that time, Mr Pence invited Mr Varadkar and his partner to visit him. On Thursday, the taoiseach and his partner, Matt Barrett, met Mr Pence and his sister at his residence in Washington DC. Mr Varadkar has invited Mr Pence to visit the Republic of Ireland, who confirmed that he is planning a trip with his mother at some stage.